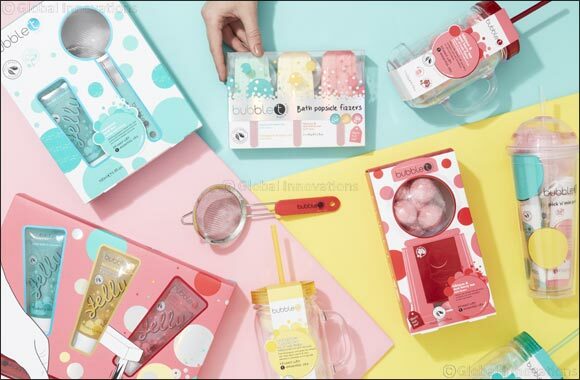 September 06, 2018 - Dubai, UAE: Tea fanatics can rejoice as renowned UK brand, Bubble T cosmetics has made its way to the UAE. The brand was inspired by the vibrant and colourful Taiwanese drink (Bubble Tea), which has become extremely popular in Britain over the past few years. Digging deeper however, the brand decided to go beyond the quirky, playful aesthetics and created a bath and body range that will make you feel good and look after your skin – that’s how Bubble T was born! Bubble T looked at a variety of teas with a wide range of health benefits, to inspire the choice of ingredients in their products. Everything they make is guaranteed to leave your skin feeling replenished, cleansed and hydrated - as well as provide a long lasting fresh smell. Also, since tea is a cultural drink and it varies from one country to another, it has encouraged the brand to incorporate different tealeaves, blends and infusions in their products to suit various tastes and moods. Not to mention that Bubble T uses Goji Berry extract in all the products, as it’s considered a powerful super food, antioxidant and contains more vitamin C and beta-carotene than oranges and carrots. All Bubble T products are free from Parabens, SLS and the brand does not test on animals. This range was inspired by the North African tea combination. Infused with refreshing peppermint, white jasmine and spearmint – this range is designed to enhance your senses, energise and revive your skin. This range was inspired by the aromatic fragrance of lemongrass, which is a plant widely cultivated in tropical areas such as South East Asia and Africa. The citrusy notes of this range blend perfectly with the notes of green tea to stimulate your mind, soul and help you to kick start your day with enthusiasm. For those who prefer sweet and fruity scents, this range is perfect for you – as the initial fragrance tones is wild strawberry mixed with hibiscus and A�ai berry tea. The products in this range are designed to wipe out any stress, restore your body and mind with the positive notes of tea-toxing formula.